While staying in Venice I took part of a day to visit the Getty Center and then continued on up the coast to Malibu. I’d met up with a friend from the area and he had a specific place in mind for lunch. It’s a place that I may have discovered on my own but with the limited amount of time I was in the area chances are good I would never have thought to stop there and that would have been my loss. 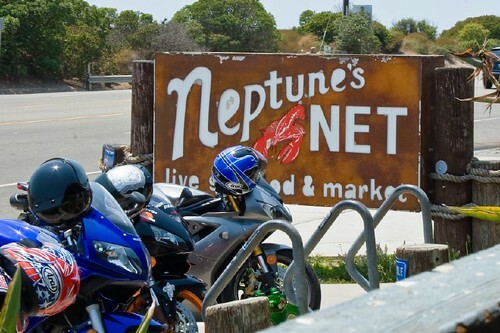 Neptune’s Net is one of those beach shack places that has been around forever. A place that families have gone to for years and have probably always taken it a bit for granted. 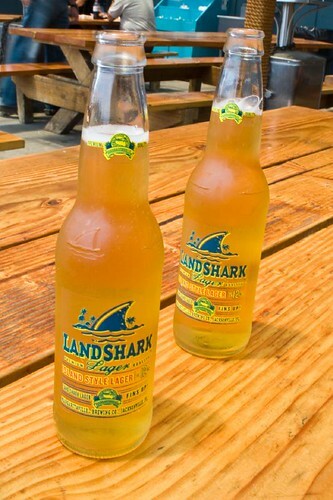 It’s located near a popular surf spot and much of the clientele crosses the busy PCH to stop in for a bite to eat after a few hours of surfing. The front of the house serves all kinds of typical drive-in type food – burgers, tuna melts, clam strips – but the real treasure is in the back of the house. There you’ll find a seafood market which not only sells fish to take home but will also steam or boil your order for you on the spot. They have live seafood (lobsters, crab, oysters…) and other fresh seafood like shrimp. We had planned to order clams and shrimp but they were out of clams when we arrived so instead we just ordered a giant pile of giant shrimp! I ordered a little bread to go along with my share and my friend ordered corn on the cob. To accompany it all we had a couple of beers. 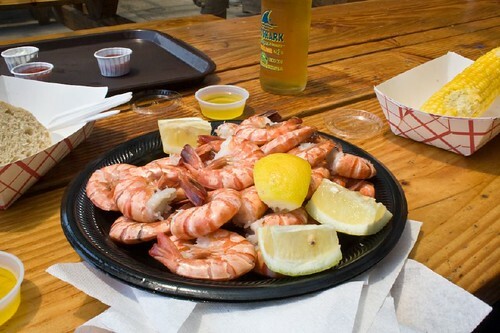 We sat on picnic-style tables on a covered patio and gorged ourselves on that shrimp. Fresh, sweet, seafood. Finger-lickin’ good! Perfect for the day and especially the location. The weather was perfect and the beach was right across the street. Could it get any better? I don’t think so and I wish I live a few hundred miles closer!